You can produce a cup of coffee using any one of various methods: drip brewing, a pour-over system, the French press, a stovetop moka pot. The term espresso refers to the brewing method that forces water at very high pressure through the coffee grounds to produce a strong but smooth brew with a trademark layer of crema. ". . . even a bad cup of coffee is better than no coffee at all." -- David Lynch, film and television director. Although the two coffees taste similar, espresso has consistently strong flavor, darker and deeper than even dark-roast brewed coffee. Espresso also typically has a thin layer of coffee foam floating on top of the coffee. Called crema, the foam has a light brown color that contrasts with the dark coffee. 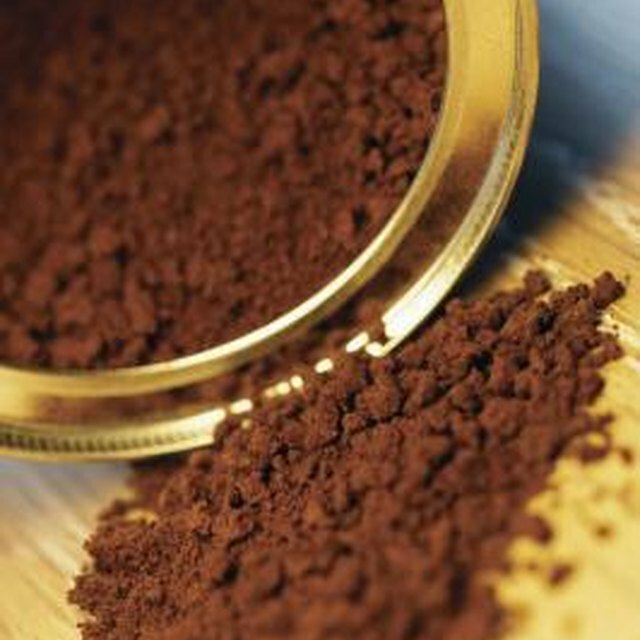 Although regular coffee comes with different sizes of grinds -- medium to coarse grinds for brewed coffee and finer grinds for drip coffee-making -- espresso comes with just one size of grind. You need to buy or grind coffee beans for espresso to a fine size because they spend less time being heated, and the extraction of coffee flavor takes only 22 to 28 seconds, reports coffeeresearch.org. You have a choice when it comes to brewing coffee, from electric drip coffee makers to manual drip systems to coffee concentrates to mix with water. On the other hand, extraction is the only brewing method for espresso. The extraction process begins with tamping the coffee grounds, or compressing them, so that the water penetrates every individual particle of coffee evenly and no water flows through the grounds without pulling out the flavor completely. After tamping, espresso machines force water through the grounds at 9 to 10 atmospheres of pressure, or 146 pounds of pressure per square inch. If you need to watch your caffeine intake, pay attention to the type and size of the brewed coffee and espresso you drink. An 8-ounce cup of brewed coffee contains 95 to 200 milligrams of caffeine, and 1 ounce of espresso contains 47 to 75 milligrams, says the Mayo Clinic. At their 2008 annual convention, the National Coffee Association of U.S reported that 20 percent of all Americans said they had drunk an espresso drink within the past week. In its 2013 analysis on coffee-drinking trends, the marketing group reported that 83 percent of Americans say they drink coffee and that Hispanic-Americans drank twice as much espresso as other groups.